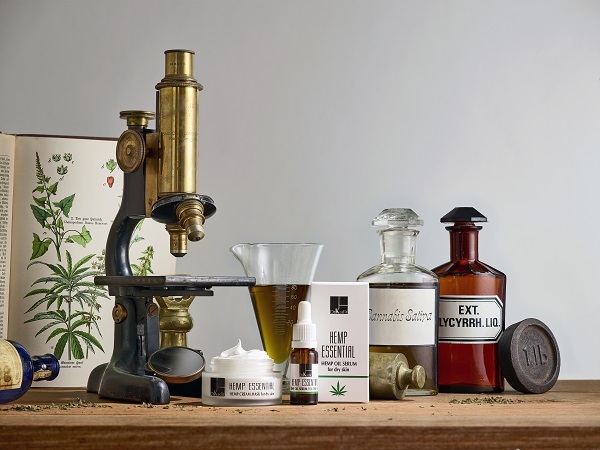 Skin care solutions based on Hemp seed oil. Hemp oil is the vegetable oil of the Hemp seed. It has been used for food and medicine in China for at least 3000 years. The oil obtained by cold pressing from the Hemp seed is a valuable source of essential polyunsaturated fatty acids, linolenic (omega-3) and linoleic (omega-6). In fact, it’s the only edible oil that contains over 80% polyunsaturated essential fatty acids. Linoleic acid (LA) and linolenic acid (LNA) are found in a ratio of 3:1, which is widely believed by nutritionists to be the optimal ratio. Hemp seed oil also contains a significant amount of anti-oxidants, especially polyphenols such as biologically active flavonoids (flavanones, flavanols and isoflavones) and tocopherols (vitamin E). Hemp oil contains higher amounts of total phenolic compounds than other vegetable oils and demonstrates higher antioxidant activities. These compounds help to prevent oxidative damages caused by free radicals. Hemp oil comes from the seeds of the hemp plant. The seeds of the hemp plant contain only trace amounts of THC, CBD or other cannabinoids. Cold‐pressed plant oils have better nutritive properties than refined oils. Cold‐pressed oils may retain higher levels of natural antioxidants (which may be removed during the refining steps of a conventional oil processing procedure) and exhibit acceptable shelf stability without added synthetic antioxidants. In addition, cold pressing involves no organic solvent, which results in a product that is chemically contaminant free. Cold pressing is simple, ecological and does not require much energy. Essential fatty acids (EFAs) are fatty acids that humans and other animals must consume from external sources, as the body requires them for good health but cannot synthesize them. The fatty acids known to be essential for humans are alpha-linolenic acid (an omega-3 fatty acid) and linoleic acid (an omega-6 fatty acid). Omega−3 fatty acids are polyunsaturated fatty acids (contain more than one double bond in their backbone). They play an important role in the human diet and in human physiology. The three types of omega−3 fatty acids involved in human physiology are alpa-linolenic acid (ALA), found in plant oils, and eicosapentaenoic acid (EPA) and docosahexaenoic acid (DHA), both commonly found in marine oils. Various enzymes, (desaturases) found to be present in different layers of the skin, are involved in essential fatty acids metabolism in the epidermis. These processes are important for the maintenance of the skin homeostasis. Linoleic acid (omega 6) is an essential building block for the ceramides in the epidermis. Ceramides are a special type of lipids, which comprise 40 to 50% of the lipids in the stratum corneum (SC). The presence of Linoleic acid in SC ceramides is essential for the permeability barrier function of the skin. By supporting the barrier function of the skin, essential fatty acids reduce trans epidermal water loss (TEWL) and increase the moisture content of the skin. Omega-3 and omega-6 fatty acids improve the firmness of the skin by inhibiting the activity of MMP enzymes. MMP enzymes break down collagen and other dermal matrix components, which support the three dimensional structure of the skin. Omega-3 fatty acids also reduce the synthesis of various compounds involved in skin irritation and aging process. Thus, provide a substantial anti-aging activity. This serum consist of oils mixture. 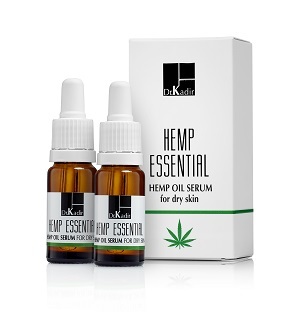 It contains 10% cold pressed hemp seed oil together with 5% vitamin E and squalene. The serum imparts a soft silky feel to the skin, improves the texture of the skin and provides efficient anti-aging action due to the high content of essential fatty acids. The mask has an extremely rich creamy texture. 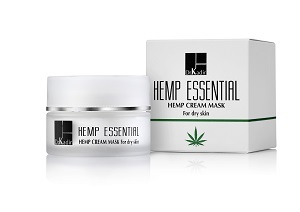 It contains hemp seed oil, Jojoba oil, vitamin E and niacinamide. These active ingredients provide intensive softening, moisturizing and anti-aging effects. For maximum effect, it is recommended to leave the mask on the face for the night. This cream mask may also be used as an intensive nourishing cream for very dry skin types.